After 10 years of austerity cuts, out sourcing, privatisation and wage freeze, public services are now reaching crisis point. In Scotland, for example, over 10,000 civil services and 40,000 local government jobs have been lost, seriously affecting the delivery of even adequate standards of services. Workers’ morale is at an all-time low and recruiting new staff becoming more difficult. Under the pretext of “cutting red tape” and increased efficiency, service users’ and providers have been put at risk. We need a public sector for the 21st century, properly funded with fairly paid staff and democratic ownership. Come and hear that case from one of the most powerful advocates of it and one who without his heart transplant last year would not be here today. Doors open from 6.00pm, tea and coffee, exhibition and stalls. Lecture commences at 7.00pm, followed by question and answer session, finishing about 8.30pm. Govan Old Parish Church is at 866, Govan Road, Glasgow G51 3UU, about 100m west from Govan Cross Underground Station. Note: Please print and produce your PayPal ticket receipt for presentation at ticket desk before Lecture. Trade unions and other organisations can make block bookings at contact@scottishleftreview.org and be invoiced for ticket costs. The Jimmy Reid Foundation is pleased to launch its latest policy paper called ‘The Trade Union Act 2016: what has its impact been so far?’ The paper examines the impact of the new Conservative act upon strikes and industrial action since 1 March 2017, finding that so far it has helped stop a number of strikes. The detailed analysis shows that a number of unions have been affected more by the Act than others and in ways that may not have been anticipated. The paper concludes by drawing upon the different experiences of unions of the Act to suggest a number of ways in which unions may best respond to the situation of the two new thresholds required for a lawful mandate for strikes and industrial action. The launch of the paper was covered by the Sunday Herald today. New Jimmy Reid Foundation working paper on automation – friend or foe? The Jimmy Reid Foundation is pleased to publication the working paper, ‘Automation – friend or foe?’ by the Unite Scotland Politics, Research and Campaigns Unit on the eve of the 120th STUC Congress (in Aviemore). The paper (available here) assesses a number of contending claims (positive, negative, neutral) on the implications of advanced forms of new technology for workers’ jobs and incomes. The paper forms a key part of the rationale for a motion to be moved by Unite Scotland to the Congress. The significance of this was picked by the Sunday Herald newspaper today. The Jimmy Reid Foundation is pleased to announce that it is hosting a lunchtime fringe meeting on its research report against the renewal of Trident (see http://reidfoundation.org/portfolio/stop-trident-renewal/ ) at the 2017 STUC congress in Aviemore on Monday 24 April at 12.30pm. The meeting is entitled ‘Trident and jobs – facts and fiction’. Chaired by Lynn Henderson, the vice-chair of the Foundation and PCS national officer, the meeting will hear from Gary Smith (GMB Scottish Secretary), Richard Hardy (Prospect union Scottish Secretary), John McInally (PCS national vice-president) and Professor Mike Danson (lead author of the report, Heriot Watt university). It will no doubt be a lively exchange of views and one of the highlights of this year’s congress. We hope that the aforementioned report will provide for an informed, productive and stimulating exchange of views. We gratefully acknowledge the support of the GMB, Prospect, PCS and UCU unions in hosting this event. The event is part of the work of the Foundation in disseminating its publications to interested groups and parties. 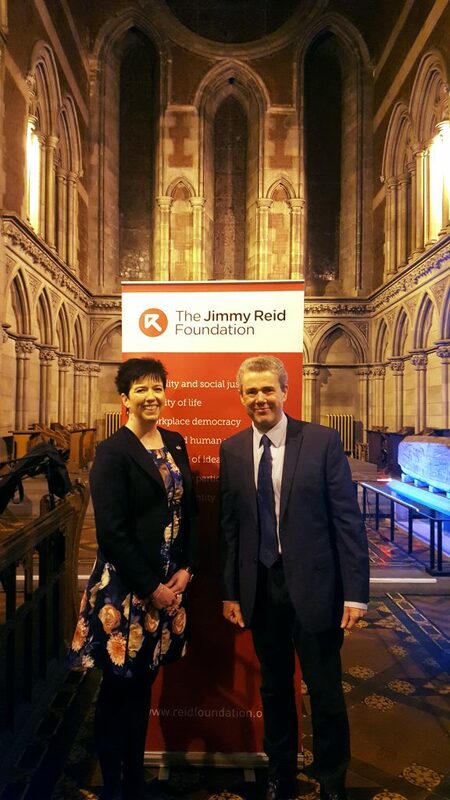 The Jimmy Reid Foundation gratefully acknowledges the support given by the Scottish Human Rights Commission in the organisation of the meeting. The financial and other pressures on Scotland’s public services are driving an agenda of piecemeal public service reform. Five years after the Christie Commission set out the principles of a particularly Scottish approach, it is time to take a holistic look at the next stage of reform. Dave Watson’s paper for the Reid Foundation examines the context and development of public service reform in Scotland and analyses the approaches of the current government and those who advocate other reforms. The paper makes the case for change that recognises the value of public services to the economy and society generally. The author is the Head of Policy and Public Affairs at UNISON Scotland. He was an expert advisor to the Christie Commission and has worked with all levels of government over a lengthy career in public service.